You might remember, if you've actually been reading along with Matthew on his adventures in visiting all 22 branches of the VancouverPubic Library system, that he at one point borrowed a Magic: The Gathering novel after procuring a promise from a friend to read the whole thing. Well I am that friend, and I am here to announce that I am a promise breaker. Not that I didn't try, repeatedly for over a month (he had to do a loan renewal trying to give me a more than fair chance to not renege on my promise) to finish that book, but in the end I had to give up in favor of finishing my last term paper in time to leave for ALA in Chicago. 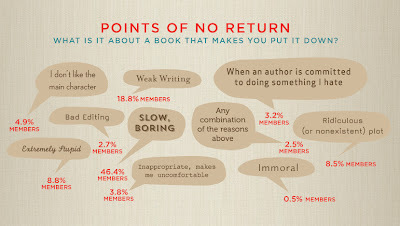 In my defense I will cite this info-graphic from Goodreads which is very non-scientifically (and thus not actually really quality evidence in my defense) examining when and why people give up on reading a book. Notably under the “point of no return” reasons for why people finally dropped a book, my experience with this MTG novel was covered by five of the reasons people selected. This aligns me with 81.6% of respondents for reasons why I was totally justified in deciding, while life may not exactly be too short, I certainly deserve better reading materials for lazy days than that novel. On the other hand, note that the percentage of respondents agreeing with the various reasons listed under the point of no return equals 100.1%. Which brings me to the second promise. Except it isn't really officially a promise, just an offer Matthew made. While he is off gallivanting about North America and will be bringing us tales from the libraries he finds along the way, I am back in Vancouver spending endless hours researching and reading about archives and libraries. Yup, I too am getting my Master of Library and Information Studies at UBC. I think I've visited around 11 or 12 of the local VPL branches since moving to Vancouver in January to start this program, but I certainly had no reason to visit every last one of them. That is, until Matthew made me the offer I could not refuse – restarting his project to visit and blog about every branch of VPL. I mean how could I possibly pass up on this golden opportunity to garner fame and fortune in the blogosphere? Beside, you might have noticed that Matthew has a very specific point of view/obsession as he visits libraries (COMICS! ), so I felt like there was plenty of space for me to bring my own unique point of view to this endeavor. You might be curious as to how I will plan out, structure and accomplish this goal. As we have already established, I’m a great fan of well structured, scientific methods and results, so I will bring to bear my considerable interests and skills in carefully managing this project. Which is to say that I have no plan or method or timeline or any possible type of organizational structure whatsoever for this project. On the other hand, I have already visited a new library branch and taken pictures and notes for my next blog post. So I feel like we are off to a good start. Here’s to crossing the finish line. P.S. I just started a brand spanking new blog of my very own, so feel free to follow my non-VPL related adventures here.